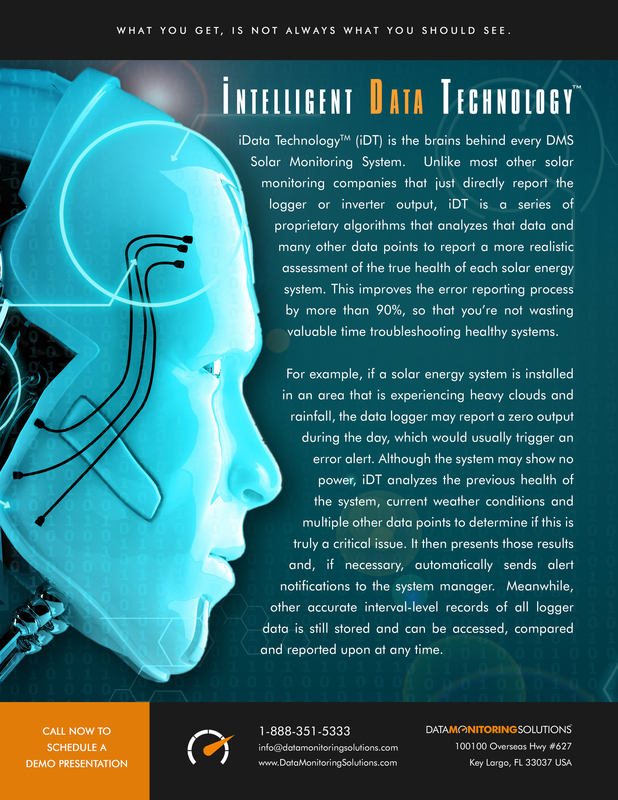 iData TechnologyTM (iDT) is the brains behind every DMS Solar Monitoring System. Unlike most other solar monitoring companies that just directly report the logger or inverter output, iDT is a series of proprietary algorithms that analyzes that data and many other data points to report a more realistic assessment of the true health of each solar energy system. This improves the error reporting process by more than 90%, so that you're not wasting valuable time troubleshooting healthy systems. For example, if a solar energy system is installed in an area that is experiencing heavy clouds and rainfall, the data logger may report a zero output during the day, which would usually trigger an error alert. Although the system may show no power, iDT analyzes the previous health of the system, current weather conditions and multiple other data points to determine if this is truly a critical issue. It then presents those results and, if necessary, automatically sends alert notifications to the system manager. Meanwhile, other accurate interval-level records of all logger data is still stored and can be accessed, compared and reported upon at any time.